I studied for a DPhil (PhD) in condensed matter physics at the University of Oxford from 2007–2011, supervised by Prof Stephen Blundell and funded by an EPSRC studentship. I used muon-spin relaxation to investigate novel magnetic materials, including low-moment and low-dimensional systems. My thesis is available here to download as a PDF, and in source form. 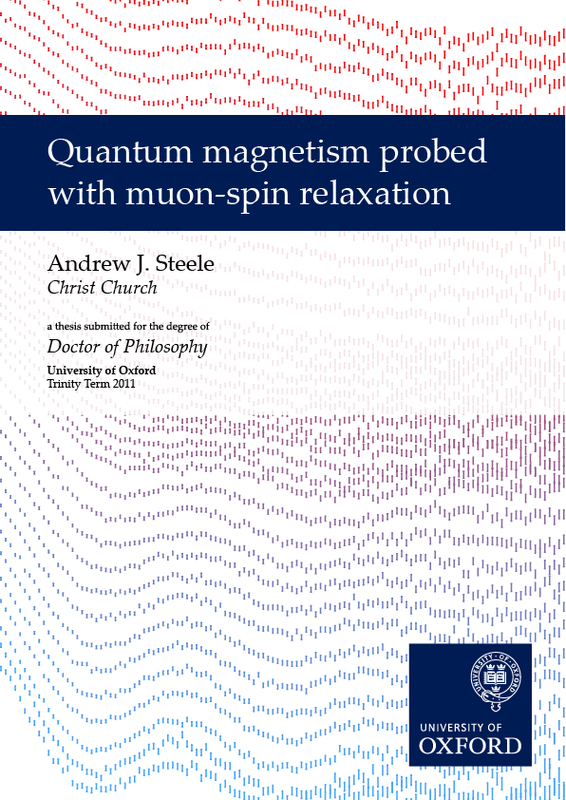 You can also read overviews for non-experts of muons, magnetism and muon-spin relaxation. As part of my DPhil, I produced MµCalc, a piece of software to analyse dipole fields inside crystals in order to analyse muon data. This program is available online, along with documentation. Both the program and the docs are open-source, so if you’d like to contribute, please feel free! This thesis presents the results of muon-spin relaxation (µ+SR) studies into magnetic materials, and demonstrates how these results can be exploited to quantify the materials’ low moments and reduced dimensionality. Dipole-field simulations, traditionally used to estimate likely muon sites within a crystal structure, are described. A novel Bayesian approach is introduced which allows bounds to be extracted on magnetic moment sizes and magnetic structures—previously very difficult using µ+SR—based on reasonable assumptions about positions in which muons are likely to stop. The simulations are introduced along with relevant theory, and MµCalc, a platform-independent program which I have developed for performing the calculations is described. The magnetic ground states of the isostructural double perovskites Ba2NaOsO6 and Ba2LiOsO6 are investigated with µ+SR. In Ba2NaOsO6 long-range magnetic order is detected via the onset of a spontaneous muon-spin precession signal below Tc = 7.2(2) K, while in Ba2LiOsO6 a static but spatially-disordered internal field is found below 8 K. Bayesian analysis is used to show that the magnetic ground state in Ba2NaOsO6 is most likely to be low-moment (≈ 0.2µB) ferromagnetism and not canted antiferromagnetism. Ba2LiOsO6 is antiferromagnetic and a spin-flop transition is found at 5.5 T. A reduced osmium moment is common to both compounds, probably arising from a combination of spin–orbit coupling and frustration. Results are also presented from µ+SR investigations concerning magnetic ordering in several families of layered, quasi–two-dimensional molecular antiferromagnets based on transition metal ions such as S = ½ Cu2+ bridged with organic ligands such as pyrazine. µ+SR allows us to identify ordering temperatures and study the critical behaviour close to TN , which is difficult using conventional probes. Combining this with measurements of in-plane magnetic exchange J and predictions from quantum Monte Carlo simulations allows assessment of the degree of isolation of the 2D layers through estimates of the effective inter-layer exchange coupling and in-layer correlation lengths at TN. Likely metal-ion moment sizes and muon stopping sites in these materials are identified, based on probabilistic analysis of dipole-fields and of muon–fluorine dipole–dipole coupling in fluorinated materials.